Advancements in concrete technology have now made it possible for customers to have beautiful decorative concrete without having to demolish their existing concrete. With the development of ¼” overlays, all the decorative features of new concrete are now made available to existing concrete, whether it’s 2 years old or 10 years old, as long as it is in good condition. The first step in addressing existing concrete is to begin with power-washing in order to obtain a clean surface from which to work off of. There are a number of cleaners on the market and Ikon utilizes its expertise to determine what cleaners are the right cleaners for each individual job. From simple cleaning solutions to full stripping prior to overlay application, the goal is making the customer’s vision a reality. 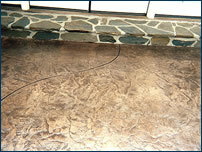 Staining provides an artistic element to your concrete that appears natural, not manufactured. Staining reacts with the minerals in the concrete to create a more organic natural appearance with changes in intensity and hue across the concrete. There are three major types of stains, water-based, acid-based and acrylic-based, that can be used to achieve varying results from marbling to murals. 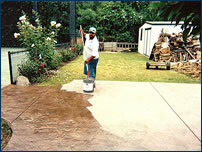 Add in the effect of sealers and you have several options to customize the look of your decorative concrete. With all the possibilities in decorative concrete design available to customers today, varying applications have developed to meet all the possibilities. From spray and brush applications, to variations on application timing and water dilution, the combinations allow for maximizing the possible outcomes. For example, stain application can occur within a few days or several weeks after the concrete is poured – each outcome providing different results with the same stain. Or changing the amount of water used to dilute the stain itself. Whether the application is a combination of spray or brush and which applicator is used first, all these variables impact the final look and feel of your concrete; and Ikon’s expertise delivers the results necessary to meet its customer’s goals. Used in combination or exclusive of stamping, saw cutting creates numerous possibilities to achieve varying results when it comes to both decorative and practical concrete solutions. From cutting designs into the concrete, to color or stain application, the possibilities seem endless. Additionally, saw cutting can assist with drainage and concrete protection.